In a recent post, I voiced the biggest drawback to the iPad (particularly the pre-Siri versions) and early iPhones is the difficulty of data entry using the touch keyboard. Unlike typing of old or even current computers, there is not a physical keyboard where one can feel the home row keys and quickly type text for their purpose. I first started using voice recognition to offset this data entry challenge on my Android smart phone where voice recognition was built into most apps very early on. Thereafter, I migrated somewhat to an iPad 2 and greatly missed (and still miss) the voice recognition features of the Android. 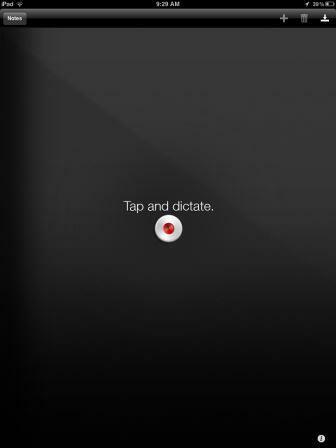 But, alas, all is not lost as there are some great apps that implement voice recognition on older versions of the iPad. Three notable apps that I highly recommend and preview in this post are Dragon (Dictation), Google (Search) and Chrome (Browser) and are pictured below. Dragon has been a pioneer in the voice recognition field and their long running Dragon Naturally Speaking software is widely known and highly praised. Years ago, I knew of a colleague who made good use of this software after carpel tunnel diminished his ability to perform data entry with a standard keyboard. The Dragon app for iPad is free; it is shocking and refreshing to find such a great app at no cost. (I understand that the Android version sells for $5.00, but with voice recognition built into most Android apps, I have not found a need for this purchase on my smart phone). As with most iPad apps, Dragon dictation is extremely simple to use, simply install the app and after opening, you are presented with the screen pictured below. Simply Tap and speak. Dragon dictation is amazingly accurate (my experience has been that it is a bit more accurate than the Google / Chrome voice recognition). You can simply state, "period" after each sentence and Dragon will start a new sentence; likewise stating "new paragraph" will create a new paragraph. I often use Dragon when I want to send an email message that will be more than a sentence or two in length. I find that it saves much time over the hunt and peck method of using the touch keyboard. As shown below, after composing your message (or note), Dragon provides some simple options such as email or cut / copy (whereby you can then easily paste it into another application). Another useful voice recognition app for the iPad 2 is the Google search app shown below. You can simply touch the microphone (Voice) icon then speak what you want when prompted and Google will make its best attempt to respond. For example, I can ask Google, "find nearby McDonalds" and Google will comply with a short message back in response with options to obtain further information via the browser or map app. Similarly, you can state something like, "directions to 100 Main Street, Albany, New York," and Google will respond. Google will respond to general verbal queries by providing likely URL links to resources which may answer your question in the same fashion as is done when you type type text into the search box. The Chrome browser is a Google product (as is Android), so it probably isn't a shock to learn that voice recognition is built into the product. 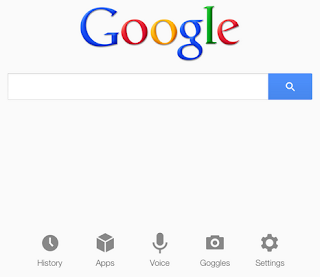 Google consistently uses the microphone icon as the access point for voice recognition and in Chrome, the microphone icon is present in the URL field at the top of the page. I have circled it in the screen shot below as it is easy to overlook this feature. Also, noteworthy is that as it says in the URL, the URL box is used for both search and URL addresses so you can simply speak a few words to initiate a search. (For many of us with Old Fart Syndrome, we are used to this box representing URL addresses only and may forget that it also is a quick and easy way to search.) I generally use Chrome more frequently than Google as I find it much more convenient to do searches, then when the search results are presented, I can hold my finger down on the link and open the link in a new tab so that I can conveniently look over several possible answers to my query to find the answer that I need.